The Organizers of the EXPO 2015 Milano official souvenir coin/medal programme have announced that His Holiness Pope Francis was presented with one of the EXPO’s limited edition “super-coins” during a meeting between the coin’s own designer, Mrs. Laura Cretara, former Artistic Director of the IPZS or Italian State Mint. 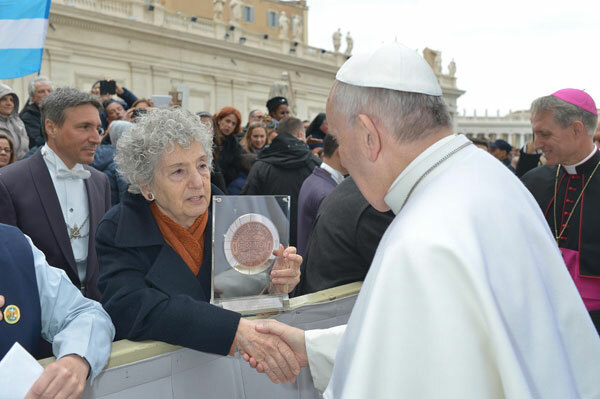 The meeting took place on Wednesday the 4th March during a public audience which was held in St. Peter’s Square at which time Mrs. Cretara presented the Pontiff with the large bronze coin surrounded with a platinum plated outer ring. The coin, of which 2,015 pieces have been produced for the EXPO was housed in a custom Perspex frame along an engraved plaque bearing the name of the Pope and the day of presentation. Mrs Cretara was brought to the Pope during the public audience and had the opportunity to shake the pontiff’s hand as well as exchange some comments about both the EXPO and the work she contributed to the world event’s numismatic and medal programme. Dr. Sandro Sassoli, director of the Museo Del Tempo, whose company are the official licensee of the EXPO 2015 Milano souvenir coin/medal programme confirmed that the Pope responded in kind by presenting a string of white Rosary beads and his blessing for a successful event. The coin/medal, at 15 cm in diameter and produced by Picchiani & Barlacchi of Florence is the largest piece made for the occasion and is expressly made for presentation to world dignitaries and noted personalities who will be visiting the EXPO during its tenure which commences on the 1st May and ends on the 31st October. For more information on the range of official EXPO 2015 Milano souvenir coin/medals, please visit their website at: http://www.expocoin.it/ Information offered in Italian and English (from April) International orders dispatched.